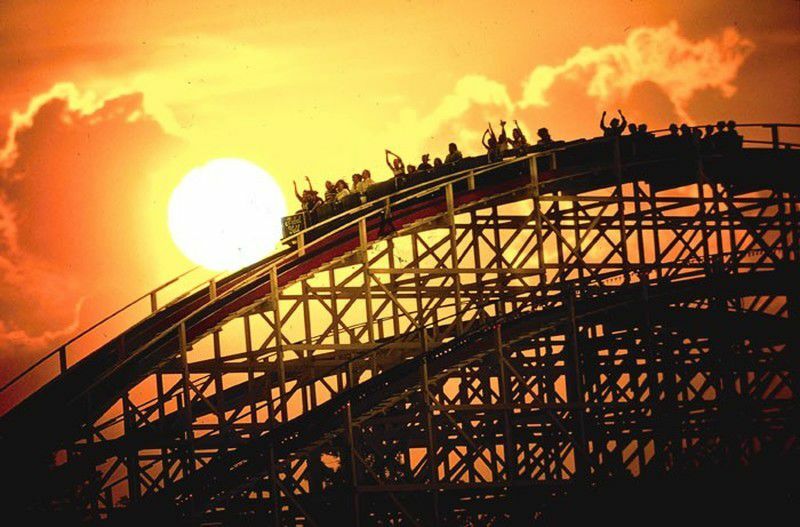 Kings Dominion is a 400-acre amusement park in Doswell, Virginia that offers a full day of fun with more than 60 rides, 15 roller coasters, live family entertainment and a 20-acre water park that’s included with park admission. Known to have some of the best roller coasters on the east coast, King's Dominion is about a 2 hour drive from Washington, DC. Kings Dominion is located at Exit 98 on Interstate 95, 20 miles north of Richmond and 75 miles south of Washington, DC. To learn more about the area, see A Visitors Guide to Richmond. What's New at Kings Dominion? In 2018, Kings Dominion unveiled a new roller coaster called Twisted Timbers. The coaster is a combination of steel and wood and includes a 109-foot-tall barrel roll drop. The theme park also just debuted Kings Dominion's WinterFest, a holiday-themed extravaganza that is open during the winter season. Attractions include a 300-foot tree, live performances, and light displays. In 2015, WaterWorks transformed into Soak City featuring many of the park’s popular water rides and attractions while incorporating all-new attractions and elements including a 65-foot tall slide tower that features three thrilling attractions, each one providing a unique riding experience, Splash Island, a new larger family-friendly splash zone, upgraded changing areas, and new restaurant concepts. In 2013, eight new rides opened at Planet Snoopy, the themed area based on one of the most beloved comic strip characters. Planet Snoopy will boast 18 total rides, spanning nearly 14-acres, doubling its size. The new rides include: Snoopy’s Rocket Express, Flying Ace Balloon Race, Linus Launcher, Charlie Brown’s Wind Up, Snoopy’s Junction, Lucy’s Tugboat, Snoopy’s Space Buggies, and Woodstock Whirlybirds. In 2012, WindSeeker, a 301-foot-tall tower opened spinning riders 30 stories above the park. Soaring 300 feet above Kings Dominion will provide a a thrill unlike no other in the Mid-Atlantic region. Also, new in 2012, Dinosaurs Alive!opened featuring nearly 40 animatronic dinosaurs in a spectacular outdoor forest setting. Park visitors step back in time to periods between 245 million and 65 million years ago in this multi-sensory and interactive dinosaur park. An additional $5.00 fee is required for this attraction. Kings Dominion is open weekends from March 25, 2017 through Memorial Day, daily for Spring Break from April 8-16 and daily Memorial Day Weekend through Labor Day. Kings Dominion opens at 10:30 a.m. everyday. Waterworks Water Park opens at noon, weather permitting Memorial Day Weekend through Labor Day. Closing times vary throughout the season. See the calendar here. Purchase your ticket online and get a discount. There is a $15 parking fee per vehicle. Visit on a weekday. The park is most crowded on the weekends and holidays. Arrive early to get the most out of your day. Head to the most popular rides first. Lines get longer late in the day. Kings Dominion is owned and operated by Cedar Fair Entertainment Company. In addition to Kings Dominion, Cedar Fair owns and operates ten other amusement parks, six waterparks, one indoor waterpark resort, and five hotels.